As an adult, I still get excited when a rainbow appears in the sky and my children, literally, shriek with delight. 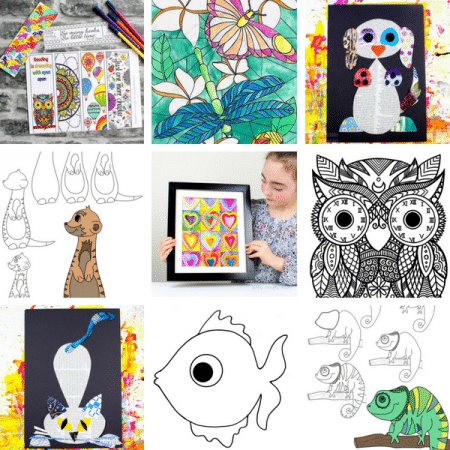 We love rainbows and if you haven’t already guessed, they’re a huge source of inspiration here at Arty Crafty Kids. Today I have the pleasure of showing you an incredibly easy paper plate rainbow craft that’s perfect for your toddler or preschooler. 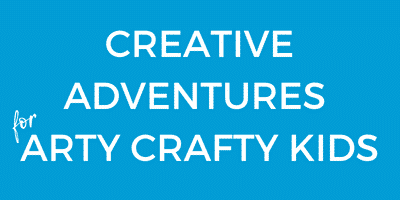 And while it’s a simple craft, it also presents a fantastic opportunity to introduce colour mixing to young children (Red/Yellow = Orange, Yellow/Blue = Green. Blue/Red = Purple). 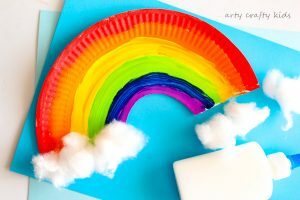 There’s also an element of fine motor work, as the children have carefully glide their paintbrushes across the paper plate to create individual arches of a reasonbly equal size – although in reality, lets not worry about the details as kids are likely to have their own wonderful ideas of how their rainbows will look ( i’m sure there will even be a brown one here or there). 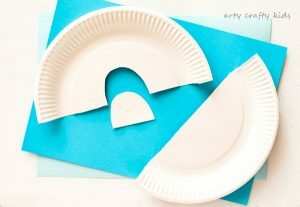 Simply cut the paper plate in half and then cut out a small semi-circle from centre of the paper plate. 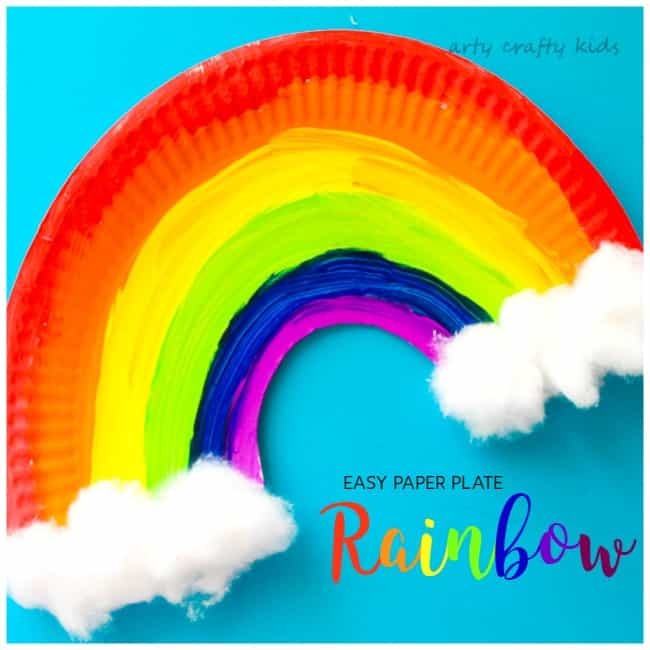 Follow the curve of the paper plate and add (as individual colours or mix them up) red, orange, yellow, green, blue and purple paint to form a rainbow. Once the paint has dried, separate the cotton wool into balls and add them to the bottom of each arch – these will form the clouds! 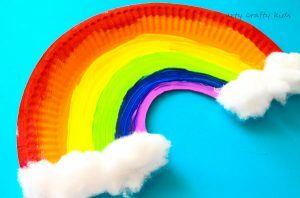 And ta-da, your toddler or preschooler will have completed our easy paper plate rainbow craft! 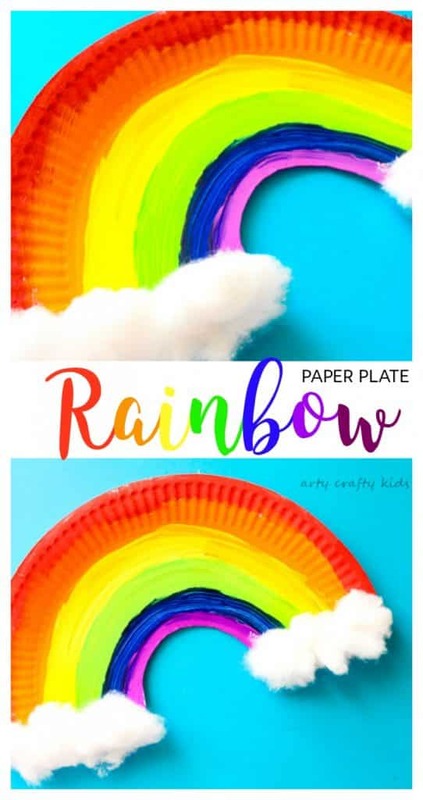 I hope they love their rainbows and if you are considering this craft for a preschool group, imagine how they may look as part of a wall display or alternatively, the children could have a go at some collaborative art and create giant rainbows from an old cardboard box! 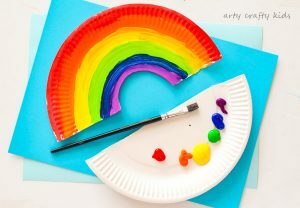 For more easy Rainbow themed art and craft ideas, take a look at our Rainbow Scrape Painting or Rainbow Butterfly Craft.